All the stuff you don't want to know about, but should. And, when you do know, you realize that for the present you are powerless to change it. Are the ETFs, the NY Fed and Rothschild banking syndicate kicking your country's central bank gold reserves down the road, too? The growing number of secession movements around the world gives rise to our topic: breaking away from current government structures that do so much harm to liberty, peace, and prosperity. Recorded at “Breaking Away: The Case for Secession”—the Mises Circle in Houston, Texas, on 24 January 2015.
via ▶ Secession Begins at Home | Jeff Deist – YouTube. Whereby parents lack the spine to stand their ground for Christianity, their children lead the way. Of course, as y’all know the fedgov or its agent, the ACLU, have no sovereign or lawful authority to be in education to begin with. What state reps don’t nullify, the people will. 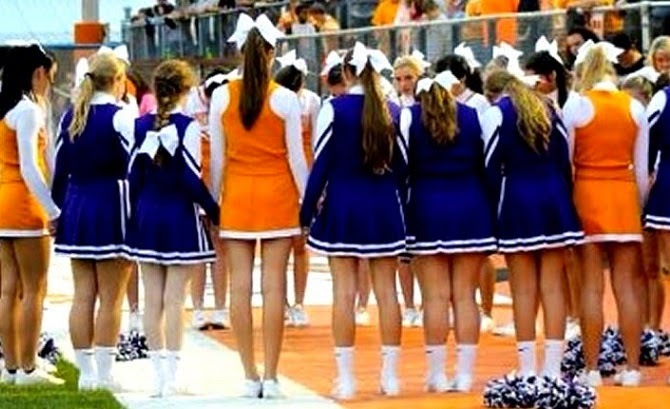 ONEIDA, TENN – For many on the Oneida High School cheerleading squad, faith has always gone hand and hand with Friday night football. “We need prayer for so many reasons especially in our community now and the troubles we face every day,” said junior Kayla King. The Oneida Special School district has decided to do away with prayer before athletic events in an effort to avoid national legal action. The district, like dozens of others in the state of Tennessee, has received pressure from organizations like the American Civil Liberties Union and the Freedom From Religion Foundation to end prayer at public schools. Oneida’s director of school’s Ann Sexton says they received a letter last fall from the ACLU reminding them it is unconstitutional to hold school sanctioned prayer at football games. “We were advised to stop the practice,” Sexton said. Instead, they instated a moment of silence before games. But that didn’t sit well with many students and community members in Oneida. “During the moment of silence all the cheerleaders came together and recited the Lord’s Prayer,” King explained. On Friday night’s game against Watertown, the cheerleaders from both teams joined hands and recited the prayer, and they weren’t alone. “In that moment the atmosphere was kind of great because it was nothing but heads bowed, and you heard the Lord’s Prayer ring over the football field,” said King. Kevin Acres has been announcing football games for Oneida for more than a decade, and he said he’s been getting lots of questions about the discontinued prayers. That’s why on Friday night he explained the change. “First off, I wanted to let everyone know on both sides of the field, this wasn’t our decision or the school board, it was pressure from outside groups,” said Acres. The ACLU isn’t alone in their efforts to stop prayer at public schools. The Wisconsin-based Freedom From Religion Foundation also sent letters to every school district in Tennessee after complaints over prayers in 2011. “As you know, the First Amendment prohibits government policies and practices ‘respecting an establishment of religion, or prohibiting the free exercise thereof.’ Both the First Amendment’s Establishment Clause and the Free Exercise Clause operate to protect the religions liberty and freedom of conscience of all Americans. It is well settled that school faculty, coaches, administrators or invited clergy may not lead students in prayer or conduct a prayer during a school event,” read the letter from ACLU. Acres says it’s frustrating but he understands the schools the position. “The majority of people in this area want to have prayer before a ball game, and I don’t think its right for a minority out away from here dictates what we do here,” said Acres. But Acres says in a way the student led prayer can be seen as a positive. “Where you had one person saying a prayer over the PA, now you’ve got hundreds maybe a thousand people saying it together,” he said. Because while prayer can no longer be said over the loud speaker, the Oneida cheerleaders hope to make sure it’s still heard loud and clear. “It is your option what you do in that moment of silence and this is our option,” explained King. Not that y’all need reminding, but the Constitution prohibits the federal government from interfering in education in any manner or form. Rushdoony’s study tells us an important part of American history: exactly what has public education been trying to accomplish? Before the 1830s and Horace Mann, no schools in the U.S. were state supported or state controlled. They were local, parent-teacher enterprises, supported without taxes, and taking care of all children. They were remarkably high in standard and were Christian. From Mann to the present, the state has used education to socialize the child. The school’s basic purpose, according to its own philosophers, is not education in the traditional sense of the 3 R’s. Instead, it is to promote “democracy” and “equality,” not in their legal or civic sense, but in terms of the engineering of a socialized citizenry. Public education became the means of creating a social order of the educators design. Such men saw themselves and the school in messianic terms. This book was instrumental in launching the Christian school and homeschool movements. From the Dust Jacket: “Man does not live by bread alone”‘; this language may be excluded from the public classrooms by court order, but the problem which is here involved for education cannot be avoided. The nature and the character of society, thus of education, hinges on the accepted concept of man; and, whatever this concept is in a given society, it can be based on an article of faith. This book will be bitter medicine, indeed, to those who see the answer to today’s problem in more education, unless the question “for what?” is confronted and resolved. Can you begin to understand now why the Conspiracy regards it essential that the respective state national guards be deployed overseas whenever possible? Hmmm? 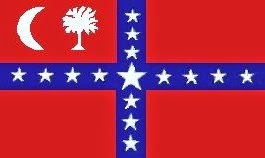 Ironically, the St. Andrews cross flew across the US southern seceding states heralds back to Scotland! Some 23.9 percent of Americans said they strongly supported or tended to support idea of their state breaking away. The failed Scottish vote to pull out from the United Kingdom stirred secessionist hopes for some in the United States, where almost a quarter of people are open to their states leaving the union, a new Reuters/Ipsos poll found. Some 23.9 percent of Americans polled from Aug. 23 through Sept. 16 said they strongly supported or tended to support the idea of their state breaking away, while 53.3 percent of the 8,952 respondents strongly opposed or tended to oppose the notion. The urge to sever ties with Washington cuts across party lines and regions, though Republicans and residents of rural Western states are generally warmer to the idea than Democrats and Northeasterners, according to the poll. Anger with President Barack Obama’s handling of issues ranging from healthcare reform to the rise of Islamic State militants drives some of the feeling, with Republican respondents citing dissatisfaction with his administration as coloring their thinking. But others said long-running Washington gridlock had prompted them to wonder if their states would be better off striking out on their own, a move no U.S. state has tried in the 150 years since the bloody Civil War that led to the end of slavery in the South. Scottish unionists won by a wider-than-expected 10-percentage-point margin. Falling public approval of the Obama administration, attention to the Scottish vote and the success of activists who accuse the U.S. government of overstepping its authority – such as the self-proclaimed militia members who flocked to Nevada’s Bundy ranch earlier this year during a standoff over grazing rights – is driving up interest in secession, experts said. “It seems to have heated up, especially since the election of President Obama,” said Mordecai Lee, a professor of governmental affairs at the University of Wisconsin at Milwaukee, who has studied secessionist movements. ‘Bout time at least one state has taken a step to protect its citizens from the Washington tyranny. Go Iowa! The opposition against President Obama continues to rise, as more Americans, both in politics and out, are starting to see through the border crisis, recognizing it’s a ploy to help Obama once again break the law, bypass Congress, and implement his agenda. States at the border are experiencing heavy economic strain as local communities struggle to come up with funds and other resources to support the influx of illegals flooding into the U.S. While many people think that the immigration crisis only impacts those states that are along the border, recent developments in states like Michigan prove otherwise. Obama’s plan to orchestrate this invasion of illegals includes transporting these individuals all across the country to be housed in shelters established in communities both large and small. No one is exempt, and no one is safe. Gov. Terry Branstad of Iowa has decided not to play Obama’s game, refusing to house illegals in his state. Coming soon to a neighborhood government school near you. Homeschooling is the answer. Stand up for your state to nullify the un-Constitutional federal schooling and your property taxes. Demand your state representative to honor his sworn oath to defend your state constitution. Be Truthful or be Gone! On the heels of their spectacular success in getting their agenda into childrens’ minds through Hollywood’s entertainment and music industries, Satanic groups have found a new way into your children’s lives by using the court system to force access to schools and distribute their satanic literature. 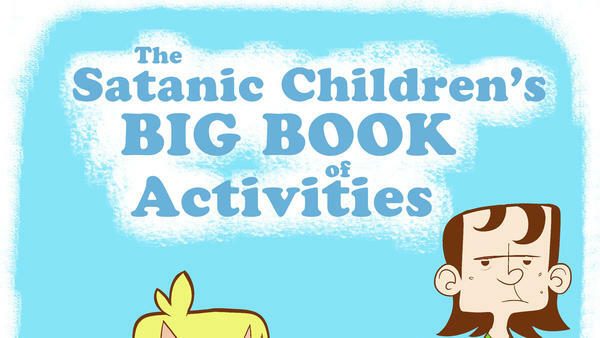 The Orlando Sentinel reported this week how The Satanic Temple wants to give out materials, including The Satanic Children’s Big Book of Activities, in Orange schools. What’s worse, the schools have no choice but to submit. Ironically, it was because of a previous ruling won by the Atheist and evangelical Christian groups that the Satanic Temple has found a way into schools. The Satanic Temple has announced that it will provide pamphlets on Satanism to students in Florida, following the school board’s decision permitting the distribution of religious materials. Among the materials that are set to be distributed are pamphlets on the philosophy, practice of Satanism, the Satanic Temple’s tenets. Also, the sect tells school children about their legal rights to choose to practice Satanism, according to the official press release. Earlier this month, the school system made a decision to let any religious and atheist materials be provided in schools. “I am quite certain that all of the children in these Florida schools are already aware of the Christian religion and its Bible, and this might be the first exposure these children have to the actual practice of Satanism. We think many students will be very curious to see what we offer,” Greaves added. This Constitution Day, Try Something New: Nullify the Feds! There is no better way to celebrate “Constitution Day” than by learning how to enforce the document it claims to celebrate. The Constitution was signed on September 17, 1787, and every year that date passes by with hardly a sound. Sure, now that it’s considered a day of “federal observance” you’ll find government schools around the country including it in their lesson plans. But these discussions generally focus on “Constitution Trivia” instead of what’s really important. While it may be good to educate our young on how many years a Senator serves, or how Supreme Court justices are appointed, it’s not enough. Seriously lacking in the public discourse is the actual purpose of the Constitution – its underlying principles. When the Constitution was being considered for ratification, there was strong opposition from famous American figures that included George Mason and Patrick Henry. One major reason for this was a fear of too much power. The founding generation spent their lives toiling under a tyranny – a government without limits. But, when the Constitution was written, it was done to codify in law that the powers of government would be limited to those which had been delegated to it – and nothing more. The entire system was created under the principle of popular sovereignty – that ‘We the People of the Several States’ created the government, and all powers not delegated to it, were retained. But that’s not something you’re likely to hear from politicians in Washington DC, political pundits, schools, or just about anywhere else. It’s generally not in their interest, either. If politicians and their backers were promoting such ideas as originalism and limited government, they’d never be able to convince you that they have the power to tell you what kind of health care plan you’ll be getting, how big your toilet can be, what kind of plants you’re allowed to grow, whether or not you’ll be able to defend your family, whom you can buy and sell from, and even when you must send your children to die for them. Throughout history, even kings and queens have often failed to survive such acts of hubris; but, in “free” America, the major parties that produce all the presidents continue to receive approval through tens of millions of votes. And where has that gotten people? Well, let’s take a look at some major issues. If you were opposed to war in the Bush administration, you’ve still got wars and threats of more wars under Obama. If you were opposed to national health care under Clinton, you got a massive expansion of government health care under George Bush, which laid the groundwork for an even bigger expansion under Obama. If you didn’t like the federal government passing the Patriot Act without even reading it, you’re still getting the same failure to read today. On the other hand, if you liked the Bush surveillance programs, you’ve gotta love the ones that Obama has given you! No matter what side of the political aisle you sit on, the federal government is not your friend. It’s not a friend to the Constitution, and it’s certainly no friend to your liberty. For years and years, people have yelled “vote the bums out!” “Call Congress now!” “March on DC!” But, in the long run, little to none of this actually works. If you oppose this national health care plan, they’ll give you that one. If you oppose today’s spying program, they’ll create a different one tomorrow. If you oppose one war, you’ll get another one. Decade in and decade out, the government keeps growing, and your liberty keeps shrinking. And it doesn’t matter if the person in charge is named Obama, or Bush, or Reagan, or Clinton. The bottom line? Looking to the federal government – whether it’s though elections, or protests, or lawsuits, or rallies – is a failed strategy.- So how about trying something new? 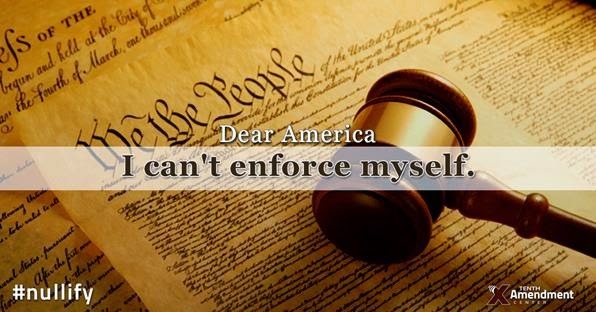 Over the years, wise men and women warned us that the Constitution would never enforce itself. I believe it’s time for people to recognize this as fact, and bring that enforcement closer to home. Fortunately, this is already starting to happen. All that’s needed is you to help take it to the next level. In recent years, more than two-dozen states have defied federal laws banning the production, sale and consumption of marijuana. Three states have banned enforcement of some federal gun laws. Three states now allow the farming of industrial hemp, contrary to what the federal government permits. And a number of states have taken steps to block the effects of NSA spying or the Affordable Care Act. In Jeffersonian-speak, this all falls under the banner of “nullification.” This happens when a state takes any set of actions that results in a federal law being rendered null and void, or simply unenforceable within that state. In other words, not a law – in practice – as far as that state is concerned. Whether you’re on the left, or on the right, or even somewhere in the middle, the path to freedom, the path to your own political goals lies not in Washington D.C. Instead, it lies in Madison, and Jefferson (City) – and other state capitols around the country. This Constitution Day, take a new pledge. Ignore and nullify the federal government. Going to the federal government to fix problems created by the federal government is as futile as it is dangerous. Treason to be sure, but why is your state legislature so reticent to inform you why they are coalescing to surrender their citizen’s liberty? Would be nice to hear how the state national guards feel about being sold out at the top. 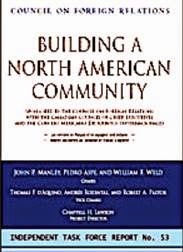 The Council on Foreign Relations (CFR) 2005 report “Building a North American Community” not only clearly outlined how George W. Bush’s lax policy on illegal immigration served to build the foundation of a North American Union, but also revealed the extent of Republican influence toward the creation of the NAU. Republican task force members who authored the blueprint for the NAU include Heidi Cruz (Economic Director for the Western Hemisphere at the National Security Council under Condoleezza Rice), Richard Falkenrath (Bush’s Deputy Homeland Security Adviser and fellow at the neoconservative Brookings Institution), and Carla Hills (a former Assistant Attorney General and U.S. Trade Representative under Presidents Ford and George H.W. Bush). Most revealing among the group is William Weld, a stereotypical Establishment Republican: socially well-heeled, wealthy, Anglo-American, Episcopalian, and socially liberal, in the mold of Nelson Rockefeller. A former prosecutor under the Reagan administration and Governor of Massachusetts, Weld authored an op-ed, “North America the Beautiful,” in the Wall Street Journal of March 23, 2005, advocating a North American Union, and coached Bush during his 2004 debates against John Kerry. He helped steer the judicial structure of Massachusetts in a pro-gay marriage direction through his appointment of African National Congress-linked Margaret Marshall, Chief Justice of the Massachusetts Supreme Court (the ANC is a member of the Socialist International). Weld himself also moonlights as a gay marriage celebrant, and offers his services pro bono to the Log Cabin Republicans. Senator Helms does not like what this governor stands for when it comes to drug policy, doesn’t think it’s appropriate to have [as] the United States ambassador to Mexico, where we have one of the biggest problems, that is, the importation of drugs from Mexico, a man who is more than soft on drugs. He [Weld] is a libertarian on drug use, believes that drugs should be de-criminalized or legalized. His record as a United States attorney ranked him, I think, in the bottom two or three when it came to drug prosecutions, so his personal philosophy on drugs carried over to his official duties, so it’s argued. On top of that, conservatives in the Republican Party would be displeased to see a man like Governor Weld [as U.S. Ambassador to Mexico], who has been so in-your-face about his views compared to those of what Republicans like to think of as their mainstream conservative views. Helms, notably a good friend of Rep. Larry McDonald (D-Ga.), was the only senator to open an inquiry into the Soviet shoot-down of KAL Flight 007, which claimed the life of McDonald, who was formerly the Chairman of The John Birch Society. Incrementally, we will continue to integrate our economies because I believe it is in each of our national interests to do so. And along the way, I think we’ll do a couple of things and I think that, well more than a couple of things, but … I think we’ll … 10 years from now, or maybe 15 years from now we’re going to look back and have a union in everything but name. It is this philosophy of government which provides a theoretical foundation for those who advocate a North American Union, which will seek to impose such socialistic policies. Rather than American ideals of limited government leading the way, neo-socialist Red Tory ideals of social democracy will provide the building blocks of such a regional entity. Aside from the near-socialistic policies revered by Segal and Bush masquerading as “conservatism,” avowed socialists, too, have been proponents of a North American Union (although, the fact that the NAU effort is being led by leftists masquerading as conservatives is deeply revealing, and serves to deceive the American people). NAPU — short for North American Parliamentary Union — is an attempt to create a structure where there is wider participation in this decision-making. It would be a democratic structure to enfranchise all citizens in the NAFTA countries. A North America Parliament, with Mexico, Canada and the United States, with people — probably first appointed, but eventually elected like they are in the European Parliament — so we can begin to raise these issues of human rights, civil rights and labor rights and immigration, which never get talked about here. Another prominent socialist advocate for the NAU is Stewart Alexander, former U.S. Socialist Party Vice Presidential candidate in 2008, who proposed a common U.S.-Mexican currency (i.e., the Amero that is being planned as a common currency for the North American Union, similar to the Euro), as well as a Basic Income Guarantee (BIG) for working people on both sides of the U.S.-Mexico border. To accomplish his goal, Stewart Alexander says it will be necessary to restructure the entire banking industry: All banking and financial institutions would be socially owned, and operated by a North American Banking Authority that would be democratically controlled. Well, my sense is that we’re moving closer and closer to forms of economic integration with the United States and Canada and conceivably Central America and Caribbean could become part of that in the coming years. I don’t see Mexico as a Latin American country. Too much of trade, investment, tourism, immigration, remittances, absolutely everything is concentrated exclusively with the United States. So, Mexico has to be part of a North American community, a North American union, which at some point probably should include some type of monetary union along European lines with a free flow of labor, with energy being on the table, etc. Castaneda is also best known for his stealth work advocating the deceptive, nuanced principles of Eurocommunism as a means of accomplishing subtle, stealthy communist revolution. In his 1993 book Utopia Unarmed: The Latin American Left After the Cold War, Castaneda argues that in order for communism to succeed in the 21st century, it must shed its former image of street revolution and totalitarian violence in favor of more palatable mechanisms of communist change, including new social movements, transnational governments, elections, and the same principles identified by Segal, such as social democracy. Castaneda, incidentally, has co-authored several books with Professor Robert Pastor, who is considered the father of the North American Union. Whether the NAU is publicly advocated by Republican neoconservatives or outright Democratic Socialists, history demonstrates that those who favor such transnational, regionalized governments are also advocates of an expansive government, the welfare state, and nationalized industry. Planning is Socialism’s trademark. The USA has no regional government and no comprehensive regional planning to speak of. In socialist countries, metropolitan regions enjoy metropolitan regional government and comprehensive planning. The economic and functional efficiencies and the social benefits that comprehensive national, regional and city planning make possible in socialist society explain the Soviet Union’s enormous and rapid economic social progress. Likewise, former Soviet president Mikhail Gorbachev on March 23, 2000, in London, referred to the European Union (EU) as “the New European Soviet.” KGB defector Anatoliy Golitsyn, in his book New Lies for Old, revealed that the creation of a European Parliament would result in a neutered, socialist Europe, and former British intelligence officer Christopher Story properly identified the communizing aim of the European Union in his exposé, The European Union Collective: Enemy of Its Member States. Unsurprisingly, it is a coalition of overt socialists and leftists masquerading as conservatives that is leading the drive toward the North American Union, as evident in the latest push for continental integration being led by all shades of faux conservatives — the Red Tory “progressive conservative” Hugh Segal, moderate Republicans William Weld and Paul Cellucci, and “compassionate conservative” George W. Bush, all of whom are ideological peas in a pod. What do we do when the federal government simply ignores the Second Amendment and acts in ways that infringe on our right to keep and bear arms? Well, James Madison laid out a blueprint in Federalist 46 before the Constitution was even ratified. Here Madison says that the people of a whole possess the advantage of having arms and through their subordinate governments would be the greatest army on earth. It would be insurmountable odds for any standing army of any nation to conquer just by the vast numbers of the armed citizenry. Madison illustrates that not only can an armed citizenry repel any outside foreign forces by large standing armies, but also, as the very last resort, can serve as a check on a tyrannical central government. It also illustrates that the natural right of self-defense and arms is indeed an individual right. This, in its very essence, is why the founders restricted the authority of the central government when it come to arms though the Second Amendment. But Madison goes on to provide a strategy that makes it possible to resist unconstitutional federal act without relying on arms – a moderate middle road between submission and revolution. He gave us a blueprint for stopping federal overreach before the Constitution was even ratified. That tool is the non-cooperation, and he assured Americans that the power of the states could keep the general government in check. The states simply do NOT have to cooperate with the enforcement of unconstitutional federal acts concerning the right to keep and bear arms. This strategy has even been affirmed by the courts under what is known as the anti-commandeering doctrine. Let’s break down Madison’s prescription. “Should an unwarrantable measure…” What does Madison mean by “unwarrantable?” The word literally means “unjustifiable.” Madison was clearly talking about federal acts with no constitutional justification. In other words, unconstitutional. But notice something interesting, Madison implies that state governments can even resist a “warrantable” or justifiable federal act. 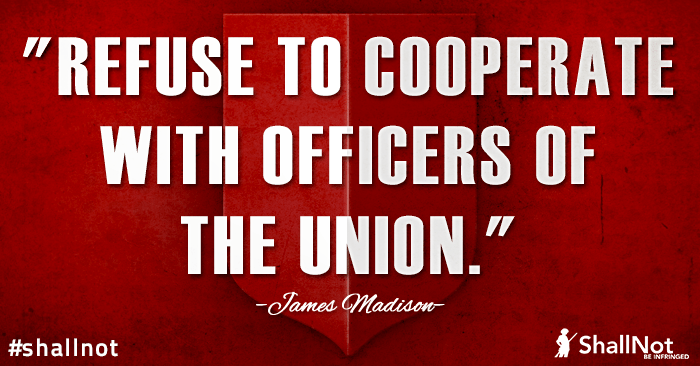 So what does Madison suggest states do when the feds overstep their authority? Oppose it! “…the means of opposition to it are powerful and at hand.” Madison anticipated the possibility of federal usurpation and clearly believed the states would serve as a check on federal power. He believed the states should and would resist unconstitutional acts. 1. Disquietude of the people – This would include protests and petitions generated at the grassroots level. Madison expected the people would throw a fit when the feds usurped power – even using the word “repugnance” to describe their displeasure. That’s a pretty strong word. And inevitably, disquietude leads to action – first at the local level, then bubbling up to the state level. That leads to the next step. 2. Refusal to co-operate with the officers of the Union – Noncompliance. Madison apparently knew what we know today. The feds rely on cooperation from state and local governments, as well as individuals. When enough people refuse to comply, they simply can’t enforce their so-called laws. Noncompliance works and it should be happening at both the state and local level. 3, The frowns of the executive magistracy of the State – Here Madison envisions Governors formally protesting federal actions. This not only raises public awareness; executive leadership will also lead to the next step – legislative action. Prior to passage of the Kentucky Resolutions of 1798, Gov. Garrard delivered a powerful message condemning the Alien and Sedition Acts and calling on legislative action. 4. Legislative devices, which would often be added on such occasions –What exactly does Madison mean by “legislative devices?” He doesn’t make that clear. But we know they include resolutions, because he and Thomas Jefferson penned the Kentucky and Virginia Resolutions in response to the draconian and unconstitutional Alien and Sedition Acts of 1798. Together, these Principles of ’98 formalize the doctrine of nullification. So what do we have today? Do we not have a federal government that has long since usurped its powers enumerated to it by the US Constitution and disobeyed its further restrictions outlined in the Bill of Rights?